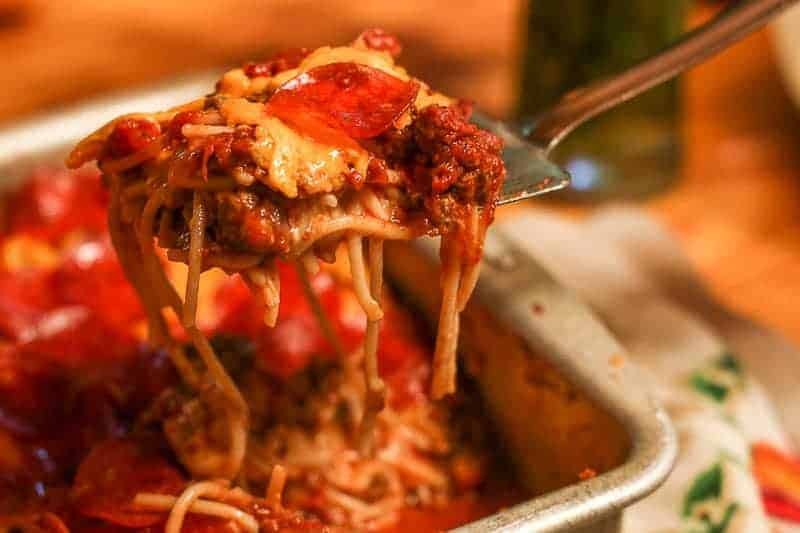 This will be the best Baked Spaghetti Recipe you will ever make! What is the best Baked Spaghetti Recipe? This is the best baked spaghetti recipe because unlike the traditional Italian versions, there is no Mozzarella. Instead, I add in layers of Monterey Jack Cheese, Cheddar Cheese, and Pepperoni. The trio combination along with my HOMEMADE meat sauce creates an incredibly wicked good, cheesy spaghetti dish. 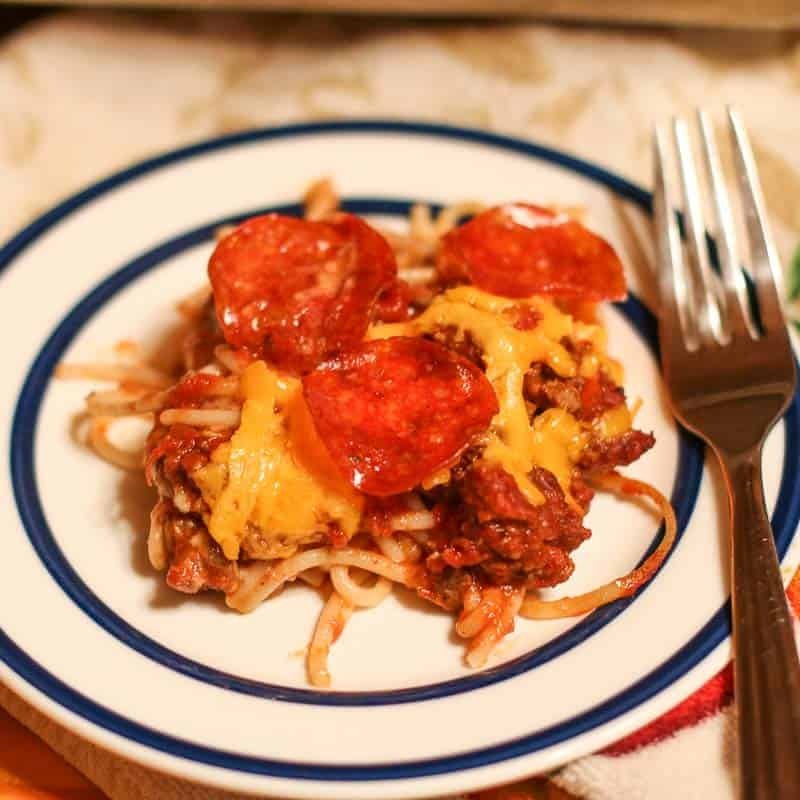 Once you have tried my Southern Baked Spaghetti Recipe once, it will be a favorite choice to make again and again! They say, “It’s all about the sauce.” I say, “It is all about the sauce and the cheese!” I have been making Baked Spaghetti Casserole for years, each time playing with the recipe until it has become absolutely PERFECT! I have made spaghetti casserole for my girls-night-in. I have made it for teacher’s luncheons. I have made it for family gatherings. I have made it for get-well drop off dinners. It has become a requested meal for me to make because EVERYONE has loved it. Everyone also asks for the recipe. And guess what? Because I love my readers so much, you are in luck, because I am sharing my recipe with you also! You are welcome! Make the homemade spaghetti meat sauce. You can do this ahead of time if you prefer. Add the meat sauce to the bottom of the pan. Add half of the pasta noodles. Cover it with half of the meat sauce. Next add a layer of Monterey Jack Cheese. Top with the remaining pasta noodles. Add a layer of cheddar cheese. Finish with a layer of Pepperoni, because why not? 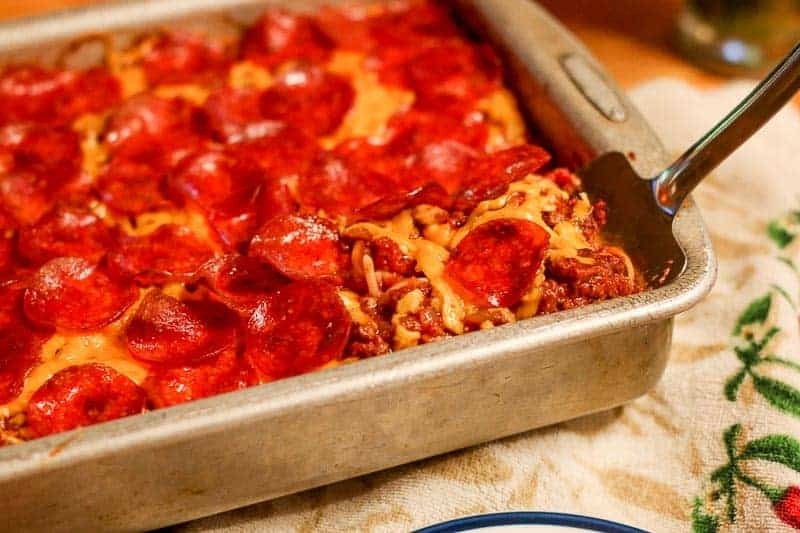 Pepperoni really makes this dish WICKED GOOD! Bake until cheese is completely melted and pepperoni is crispy. 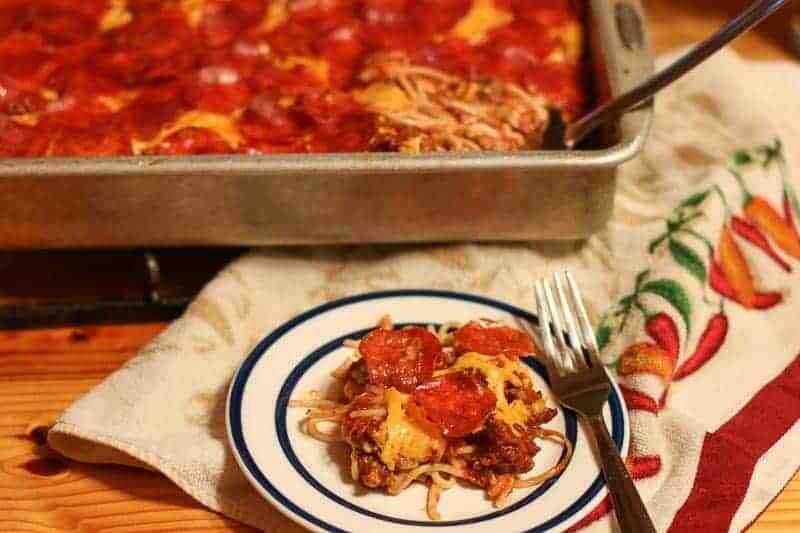 How good does this baked spaghetti casserole look? I mean seriously… How could you not want a plate of this? Just cut out a chunk and put it on a plate. I like to serve it with a warm loaf of homemade garlic bread. I also make a nice Italian salad to go with it. My homemade Copy Cat Olive Garden Salad dressing can be whipped up in less than five minutes. It is the perfect salad dressing to go with this dish. End it with my easy Southern banana pudding or Chocolate Cherry Sheet Cake and you will have one killer homemade meal!! Your family and friends will swear it is the BEST MEAL EVER!! Can you freeze freeze spaghetti? You can easily freeze spaghetti. 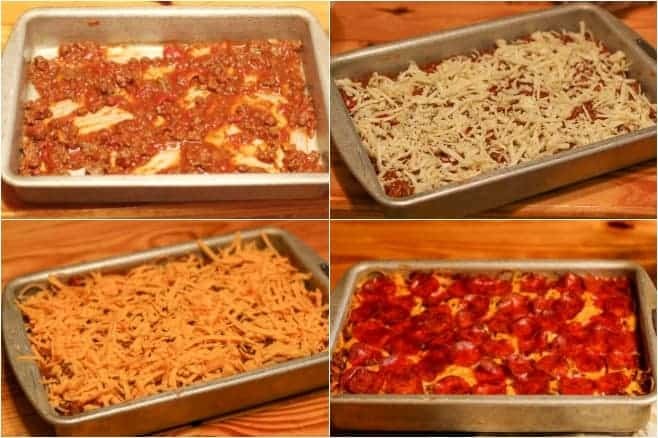 The best way to freeze this spaghetti casserole recipe is to follow the instructions until it is time to bake in the oven. From there, cover it tightly with saran wrap and then a layer of tinfoil. This will protect it better from freezer burn. Thaw it out completely, then bake according to directions. If you have already baked it, you can freeze the leftovers in a freezer container, thaw, and reheat it when you are ready to eat. *Cooking Tip: Whenever possible, use freshly grated cheese. It has more flavor and I swear it melts better. *Cooking Tip: My baked spaghetti recipe, adds layers of homemade sauce to the bottom of the 13×9 baking pan. This keeps the pasta from sticking. Don’t cut corners and buy premade jar sauce. It isn’t the same and it won’t be as good. I promise it is worth the effort to make your own sauce. *Cooking Tip: I like this recipe with regular spaghetti noodles because of the hardy texture. My husband prefers this recipe with angel hair pasta. Both are great in this recipe, so use the pasta type you like. This is home cooking at its best. You are going to love this recipe. And when you do, please share it with your friends. After all “cooking good food is love made visible.” So share the love. This is the best Baked Spaghetti Recipe ever. Layers of Monterey Jack and Cheddar Cheese, Pepperoni, & homemade meat sauce creates an amazing dish. In a large stock pot, cook tomatoes, tomato sauce, onion, bell pepper, garlic, basil, Italian seasoning, oregano, celery salt, salt, pepper, and brown sugar at medium heat and bring to a boil. Cover, then reduce heat and simmer for one hour. Crumble and cook ground beef. Add ground beef and water to stock pot and cook an additional 20 minutes. Cook pasta noodles according to directions. In large 13x9 in pan lightly cover pan with meat sauce. About a ½ cup. Add ½ pasta noodles. Layer half of meat sauce. Layer Monterey Jack cheese. Layer remaining pasta noodles. Layer remaining meat sauce. Layer Cheddar Cheese. Cover cheese with pepperoni slices. Bake in oven for 30 minutes or until cheese is melted and bubbly and pepperoni is crispy. Let it rest for 5 minutes, then serve in squares. You can leave it out if you don’t have any. It just gives the spaghetti a little more flavor, but it won’t ruin it to not use it. omg this is seriously my ideal dinner… LOVE it! I tried this recipe and it is sooo good. It has now become my favorite baked spaghetti!! This recipe is crazy! I’ve never seen pepperoni on a pasta! I love the change up on the cheese combo! And the added pepperoni?! BONUS! Love this! What great comfort food. Yum! This really looks delicious. What a marvelous version of baked spaghetti! Nice post. Wow! This does sound absolutely delicious! This would be easy to make ahead of time and then pop into the oven when needed. I agree about shredding your own cheese….it does melt better…it isn’t coated with something to keep it from sticking together in the package! This looks yummy! I wonder zucchini noodles would do in it? I love them just as much as regular pasta but have never tried using them in a casserole approach before! Haha.. This is totally southern not Italian- the pepperoni is brilliant. People down here love it- have you had the pepperoni rolls you can get at gas stations everywhere in the south? They sell like hot cakes. And I’m in total agreement about not using pre-shredded cheese when possible- it doesn’t melt as well because they coat it with stuff to keep it from sticking together! This baked spaghetti is a perfect meal to make when I am busy!!! I love the combination of the cheeses. That is comfort food at it’s best! Save a bit for me! This is such a perfect, homey, comforting meal! Ok Katie, you`re KILLING me here!! I was sold at cheese & pepperoni but more cheese & meat sauce! So totally drooling here!